That was a question we asked ourselves. 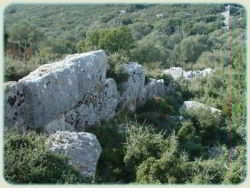 We first came across the Cyclopean Wall (Κυκλώπεια Τείχη) on a coach trip during our holiday in Kefalonia. The tour guide only mentioned it is passing and the coach did not stop, so we decided to go back again when we hired a car to see if we could find a bit more about it. 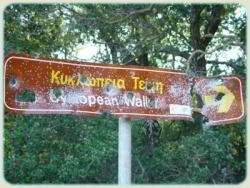 The Great Wall of Kefalonia? 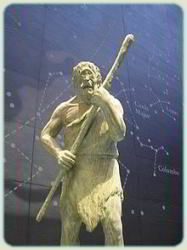 The word first conjures up thoughts of Cyclops (Κύκλωπας - from the Greek Κύκλος, meaning circle and οφθαλμός meaning eye), the savage one eyed giants of Greek mythology. The word is now used to mean of extraordinary size and strength. 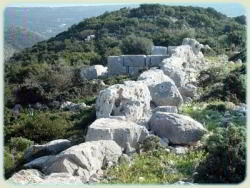 In architectual circles it describes ancient masonry, in this case Mycenaean, which is composed of huge stone blocks laid without mortar. 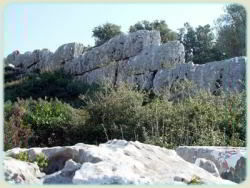 The blocks are considered to be so large that it would require giants to handle them. 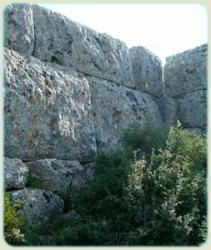 Hence a cyclopean wall is made of huge irregular boulders, fitted together with small stones filling the gaps. 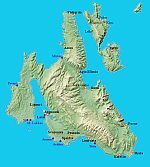 Examples can be found around the eastern side of Greece, as well as this one on Kefalonia. 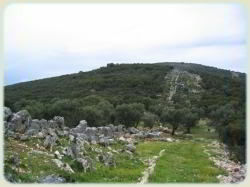 The wall is located near the former Doric temple of Demeter and possibly built in the 7th century BC. Unfortunately thay are now in poor shape due to the combination of wind, weather and being a good source of building materials. 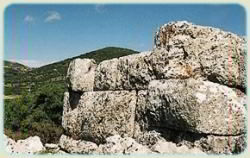 The wall is several kilometres in length and was intended to protect the ancient town of Krani, the remains of which can be found nearby. Despite the delapidated state it remains a good example of this ancient Greek feat of engineering. When you see the size of the boulders and try to imagine the construction nearly 3000 years ago, your mind will be boggled.